The Swedish company Begacom IT Business took over the development of this search engine some months ago. The company also decided to do some changees both in functionallity of the search engine and its look. As a website owner you are allowed to use this search engine for FREE for making your website easy to find by using any word from your content. It is up to you to decide how to do it. And when you do it right you will feel the satisfaction. If you do not have any idea about how different words can be useful you can just click arround on the links above and you will see how it works. By using this search engine you have an opportunity to get your website visible in some of the first results and you can read more about it here below. What to do to use this search engine right? 1. At www.justfindit.se you can register your web address (domain name) for online searches for FREE. 2. You will get your own user - admin site where you can log in and administrate the search optimization for your web address - for FREE. 3. The indexing and saving in the database is something that you manage and you are the one who creates the database results. That is so easy! And if you use the script mentioned below you will just get your search optimization better than it is. and the script can work only if your web address exists in the database as registered user. 4. If your web address exists in the database you can earn points by using the script above. 5. By using this search engine right you will be able to make your website searchable in real time. So why not, Just Find It now! Lexicon at JustFindIt.se You have an opportunity to filter your search and get what you want. data found in magazine and lexicon. And of course, earning points will put you on the higher position. 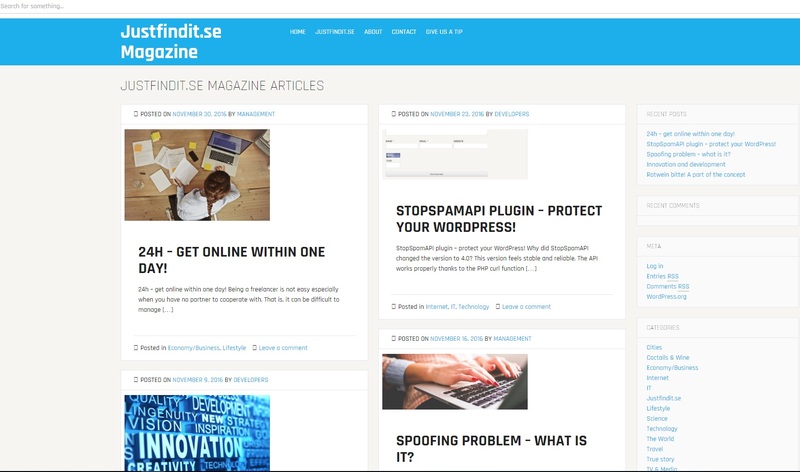 More about our online magazine you can read at magazine.justfindit.se/. The project called Just Find It was started in summer 2013. The main reason for that was and still is to give all website owners a possibility to make their websites searchable in any search here. A typical website owner can say someting like this: "My website is not registered in search engines." or: "I can't find my website in any search engine." or: "How long time will it take before my website appear in search engines?" These questions have created a wish to do something about that. That "something" is just this project called Just Find It. By using this search engine right you will be able to make your website searchable in real time. In the end of May 2017 all External data was removed from searches that was available in our database. 1. As registered user you can allways log in and work with your account. a. You can always remove your account. b. You can always edit your account. 2. The chosen content of your website is stored in the database and other Internet users can not manipulate it. a. The chosen content of your website is stored just for making your website visible in searches. b. You can always remove the content but your website will not be found any more. 3. This search engine has no connection to other search engines and shows own results. 4. Wrong use, abuse or any kind of wrong manipulating of data in the search content can simply cause disabling and removing your account.